We are honored to announce that Soil Solutions has merged with EcoTech! This joining of forces brings together 2 of the strongest and most innovative leaders in the Pacific NW Environmental Business community. Though we will now operate as one company, Soil Solutions, you can rely on many of the same working relationships that you have had in the past at EcoTech. Your business will still be supported by the same people and you can still depend on the same quality of work. We are all very excited about the enhanced service capability this merger provides. We are confident that by joining forces Soil Solutions will be far better positioned to respond efficiently and professionally to you and your clients inspection and remediation needs. 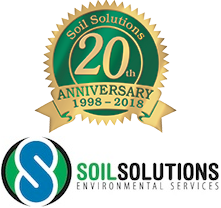 In case you didn't know, Soil Solutions was founded in 1998. The growth and success achieved by this locally owned company is attributable to the excellent personnel we are blessed to employ and by bringing the expertise and integrity of EcoTech staff on board we are now even more capable. If you have any questions or concerns regarding the merging of Soil Solutions and EcoTech please do not hesitate to let us know. All phone numbers and emails you have used in the past with EcoTech will still put you directly in touch with us. Thank you, sincerely, for your continued support. We are confident that by forging a larger organization our stronger service will be of great benefit to you and your clients.